Clear mascara for men is a great choice if you want to lengthen and plump lashes without telltale smudges. Whether you're a metro sexual, cross dresser, or theatrical performer, or just a guy who loves long, lashes, beauty staples such as mascara can help you polish off your look with minimal investment and skill. Few cosmetics offer the same impact as mascara. An instant eye opener and brightener, mascara not only draws attention to your eyes, it can also create the appearance of fuller and fatter lashes. Mascara is a cosmetic product that separates lashes while adding volume, length, and even curl. Although mascara is not the most obvious choice for eye definition, the subtle enhancement mascara makes can really play up the eye area. Mascara is normally applied as the last step in a cosmetic routine, after eyeliner and eye shadows have been applied. 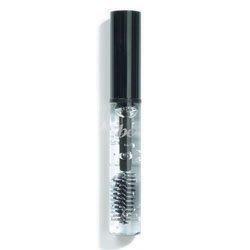 Clear mascara for men is a fantastic choice for adding light separation and pliable hold to lash and brow lines. Curl lashes: Some women and men choose to curl lashes with an eyelash curler prior to mascara application. To curl lashes, clamp curler at the base of the lashes and hold for five seconds. Move to the middle of the lashes and clamp curler again for five seconds. Lastly, clamp eyelash curler at the tip of the lashes and hold for five seconds. Curling lashes will make eyes look bigger, so go ahead and give it a try! Hold taut: Once lashes are curled, you can begin applying clear mascara. Hold eye taut by pulling at the upper and outer corner of the eyelid. Look upwards and apply mascara at the base of the lash line in short, quick strokes. Allow application to dry and then reapply. Define lashes: Defining the bottom lashes with mascara is purely optional. With typical color mascara, bottom lashes can get smudged and messy and result in a raccoon look. With a clear variety, definition is subtle. Apply mascara to the bottom lashes by lightly stroking the lash line in short, quick strokes. Clear mascara has more than one benefit! Not only will clear mascara help define the lashes; the clear product can also be used to groom the brow lines and hold their shape. Rather than mess with waxy pomade or a stiff hairspray, clear mascara will set the brows while adding a light sheen. Groom brows: Make sure brows are groomed as desired prior to application. Apply: Apply clear mascara in short, quick strokes across the brows. Direct hair as desired to control shape. If you want to define your look, draw attention to your eyes, and keep you appearance clean and minimal, clear mascara is a fantastic beauty tool that will add sheen and volume to your lashes without visible depth. Rather than reach for a colored mascara variety, why not try out a clear formula?